This beaded cuff pattern, a real beauty at left, is offered on Etsy by 1beadweaver using the square stitch in a pdf pattern for $2.50. 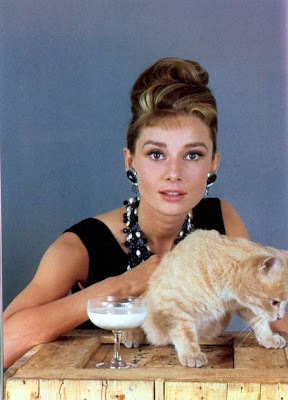 There are also many free Audrey-like jewelry pattern links here in this posting you might want to bookmark. 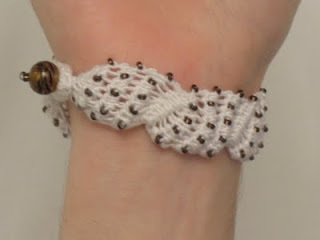 Lion Brand has a particularly smart and trendy bobble bangle, knit with US 4 and 6 needles (3.5, 4.25 mm) and a small amount of yarn stretched over a ready-made wooden or plastic cuff form you can purchase at Michael's or any local craft supply store. 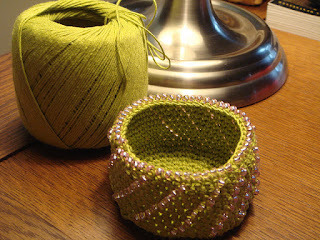 To make the bobble, knit a series of sts all in the same stitch, turn and knit again, then turn and purl and so forth. Here's how LB instructs: Make Bobble "(K1, yarn over, k1) all in next st; turn and k3; turn and p3; turn and k3, turn and k3 together - Bobble made." 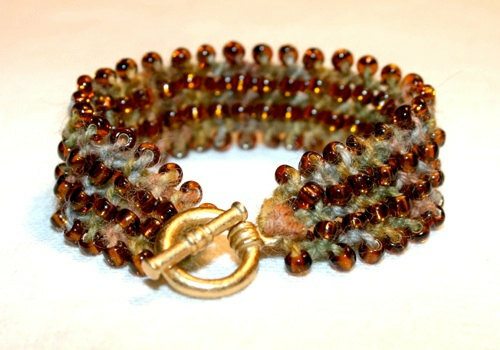 You'll find the free knit bracelet pattern link below. Here's another free pattern for a knit necklace, which could easily work for a color block bracelet, too, with smaller wooden beads, recently seen in Vogue Magazine for over $100. 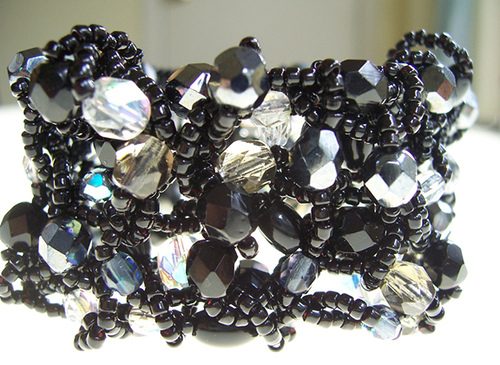 With a few contrasting beads of different shapes and clarity, voila! The free summer necklace pattern is here. 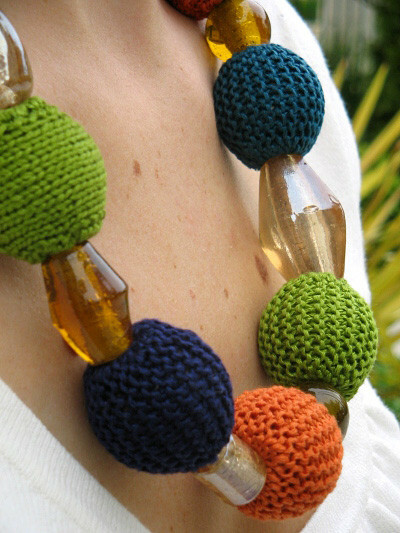 Jude Butterworth offers some glorious crochet jewelry at her Etsy shop. 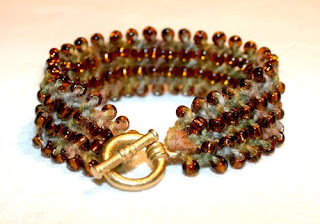 Jude's beautiful work has been exhibited in art galleries and much of it is done in free form crochet, but she does offer this Tunisian crochet beaded bracelet pattern. 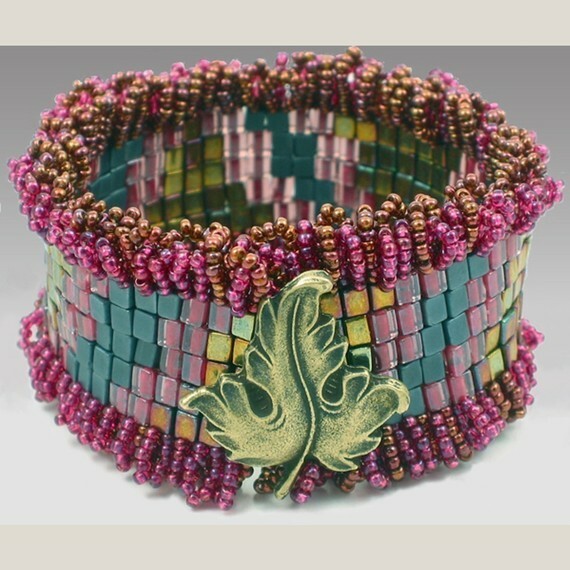 Jude allows you to resell jewelry made with her patterns as long as the pattern is attributed as her work. Rosemary Hill of designs by Romi has designed knitted and crocheted jewellery and included 26 designs in her pattern book Elements of Style. Rosemary gives you complete instructions for quantity and size of beads to create lovely works of art like this beaded cuff of her design, a free pattern on Knitty. 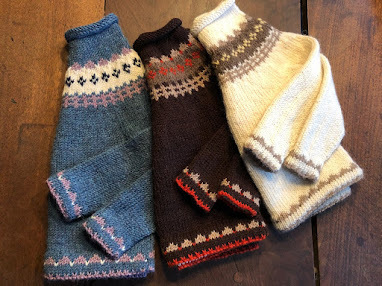 Free pattern link below. Beth Todd offers her knitted stretchy bracelet pattern on Etsy for $3.50 and allows resale of items with design attribution. Beth says this bracelet pattern is a great way to use up stash sock yarn. You'll find BethToddCreates here. 1beadweaver has several pdf patterns for beaded jewellery, mostly bracelets necklaces, for sale at minimal prices. She offers the Peyote stitch US flag motif bracelet in a pdf for $1.60 or the whole kit and kaboodle, that's beads, star button, and instructions for $29.00. 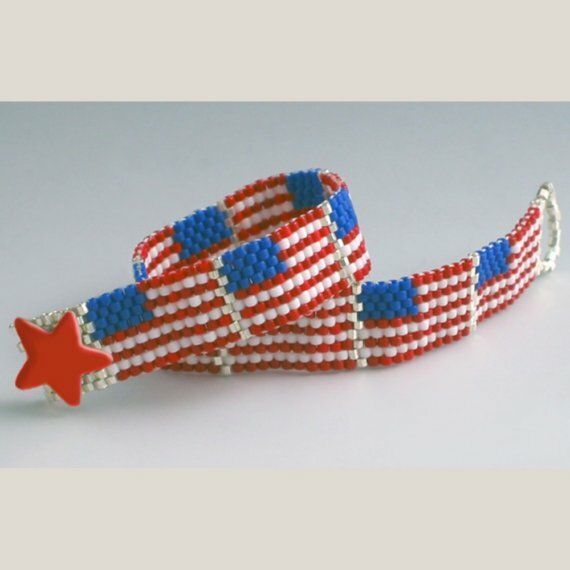 Just think what a hit this flag bracelet would be on the 4th of July or any patriotic holiday like today, June 14th, Flag Day! 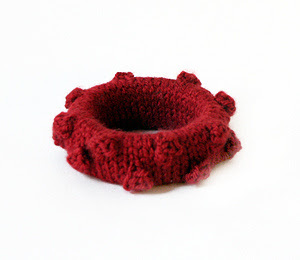 More exciting new jewelry patterns to knit or crochet here. Another friendly source for free jewelry patterns is Domestic-DivaOnline, who sews, glues, paints, airbrushes, you name it, Diva does it and gives advice freely and concisely. You'll find several free jewelry patterns with well-written and photographed instructions at domestic-divaonline.com. Copyright Sharon Watterson at knitnscribble.com, 2012. 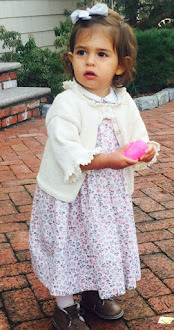 Easy hat patterns with photos!